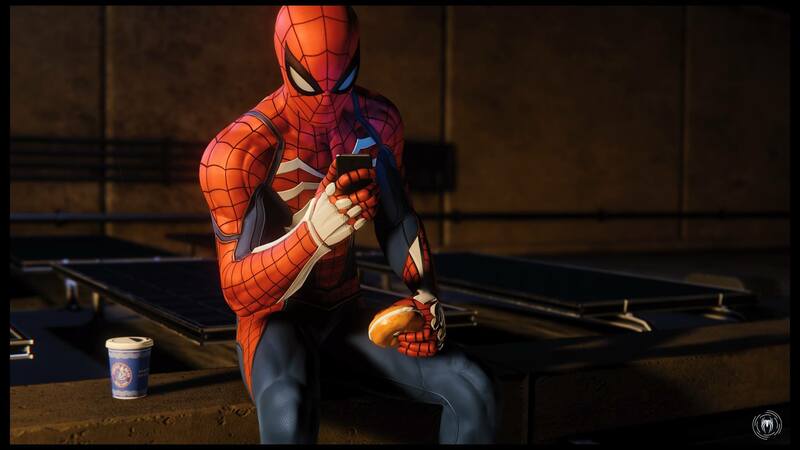 Spidey checking his own Metacritic rating. Easily of one of the most anticipated exclusive games of the year, Spider-Man was well worth the wait. Marvel’s Spider-Man is the latest effort to come out of Insomniac Games, primarily known for their work on the Ratchet & Clank series and the sleeper Xbox-exclusive Sunset Overdrive. 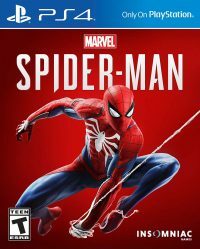 While obviously based on lore set up from other Spider-Man stories in consumable media, this game is its own story with no connection to the Marvel Cinematic Universe. At that, both Insomniac and Square Enix have been hush about the game being connected to the upcoming Square Enix Avengers title, so we can’t say much about that. Yep, that’s the Avengers tower in the background. Did we see any other Avenger around? Find out for yourself. What we can say is Spider-Man is an open-world action game that follows a post-college version of Peter Parker who’s struggling to pay rent as he’s no longer working as a photographer with the Daily Bugle. On top of that, he and MJ (Mary Jane Watson) are no longer in a relationship, making this a different Peter Parker that Spidey fans take control of. For the sake of not giving too much away, that’s all we’ll say about the details of the plot and setting itself. Yes, Spider-Man is a typical superhero story. A lot of the themes you’ll find are expected and oftentimes cliché, but the good news is everything about the game’s storytelling experience just works. While I’m not a fan of Peter Parker’s look visually (he kind of looks like a combination Andrew Garfield and Nathan Drake), he’s still probably the most likable form of Peter Parker I’ve come across in modern media (including Tom Holland), and that statement still holds true for other key characters in the game like MJ, police chief Yuri Watanabe, and a young Miles Morales. While the game separates itself into three main acts, there is nothing noticeable about it as the story makes its transitions, the subtle easter eggs and the cinematic style make it feel like a traditional Marvel Studios film experience. Again, I don’t want to go too much into how that works for the sake of not spoiling it, but that’s the feeling you’ll get when playing the game and watching its cutscenes. The game’s depiction of New York City is superb, and it all looks fantastic in 4K. As good as the story ended up being, it holds second fiddle to Spider-Man‘s robust gameplay. It isn’t by any means perfect, but Insomniac definitely nailed the feeling of being Spidey. Swinging around an open-world New York feels immensely satisfying and it becomes your main method of travel. I’ll even go as far as to say it beats stealing vehicles in Grand Theft Auto, and since we’re on the subject of other open-world games like GTA, if you even try to attack random civilians, instead of doing that, Spidey will just give these people high fives and just be a friendly neighborhood Spider-Man. There’s even a trophy tied to this, so it’s a really nice touch. Of course, you have a life away from web slinging. The story’s mandatory forays as Peter Parker have you working in a homeless shelter run by Aunt May while also doing some work relating to Peter’s actual occupation. These sections of the game have the feel of a walking simulator with some puzzle stuff mixed in, and they’re nowhere near as fun as the action you’ll experience behind the mask, but that might’ve been what Insomniac was going for. What kind of superhero prefers their normal life anyway? 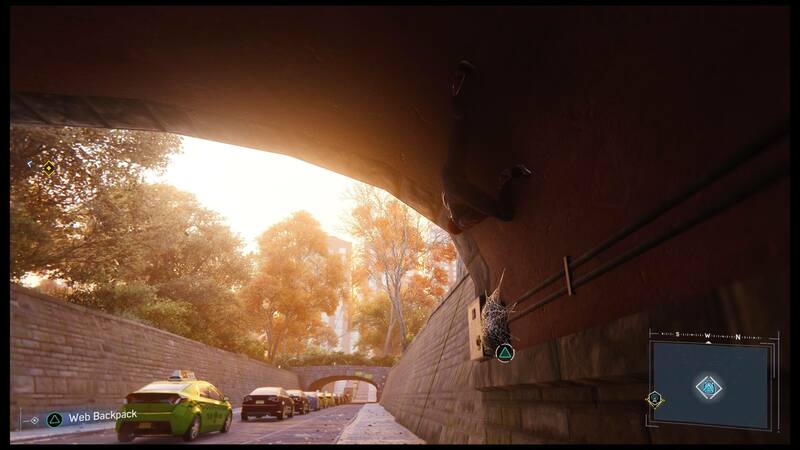 As Spidey, New York is your sandbox and there are plenty of things to do as you swing your way from building to building. Aside from the main path, there’s all sorts of awesome collectibles like the backpacks Spidey left throughout the city containing various knickknacks to build the game’s lore, communication towers to unlock various parts of the map, points of interest to photograph (like the Brooklyn Bridge or Daily Bugle), and if all that isn’t enough, there’ll be crime after crime to solve every few minutes everywhere you go. To add to all the hustle and bustle, a podcast hosted by J. Jonah Jameson will oftentimes play in the background scrutinizing your every move (because he hates Spider-Man), further motivating you to continue the vigilante lifestyle. When you first get your hands on the game, you’ll probably draw a lot of parallels to the Arkham games just because of how similar the two feel as far as the game’s combat system goes. 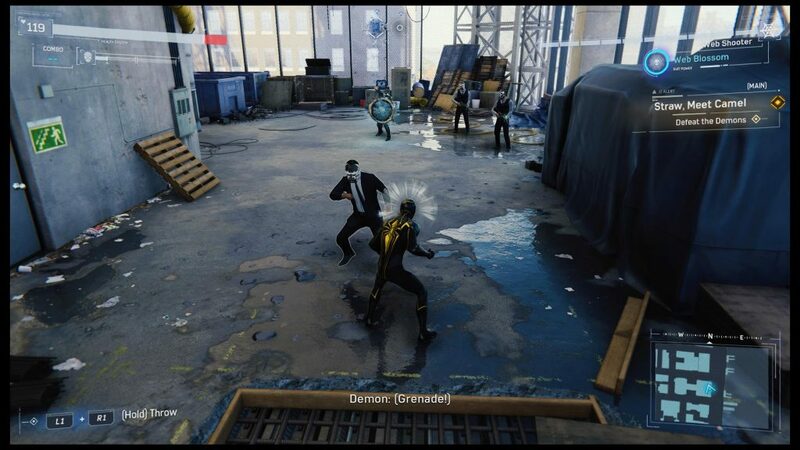 The hard-hitting melee combat is there, but when you get down to the finer details, it feels the way a Spider-Man game should. Instead of brutal counters, Spidey has the ability to make slick-looking dodges thanks to his spidey-sense, which is represented by a thought bubble-like webbing visual emanating from his head. As simple as it is, if you’re used to the combat in Arkham, it could be a little complicated as the dodge button is mapped to the Circle button when you’d expect to be pressing the Triangle button like in Arkham. This adds to the learning curve, especially when dealing with more than four enemies at a time which further adds to the high-octane and hectic nature of it all, but 98% of the deaths I had when playing were my own fault. Did I dodge as much as I should have? Did I dodge too much? Did I mix up my moves? Did I consider the environment around me? All these things factor into the game’s deep combat gameplay. Spidey has a slew of abilities at his disposal with fighting aside from just his fists. You can shoot whatever webs you have at people to stun them, and you’ll eventually have other webs that’ll do different things–like electrify enemies, or catch multiple people in the same web. And while you can definitely do all the fighting you want from the ground, the game encourages you to cause damage while airborne, and it’s so much more satisfying when you do it that way. From behind-the-back stealth takedowns to landing on someone hard from a building 20 stories high, the amount of ways to beat the bad guys is extremely plentiful, and when you find yourself traversing through New York rolling through crime after crime, optional subtasks like having to web five enemies to a wall or throw environmental objects at your enemies will keep you wanting to vary your fighting style. I didn’t actually do a whole lot of fighting while slinging until later in the game when things started to get more difficult despite having more skills and abilities, and not only did I find it more difficult to fight while on the ground, it was also more of an annoyance because the camera angles would have buildings in the way as you try to do your thing. Having to maneuver the camera while worrying about dodging and thinking about how to attack can get pretty complicated, and if buildings are obstructing your view and spidey-sense, you’re in trouble. This is the other 2% to the 98% I mentioned when it came to situations where I died. 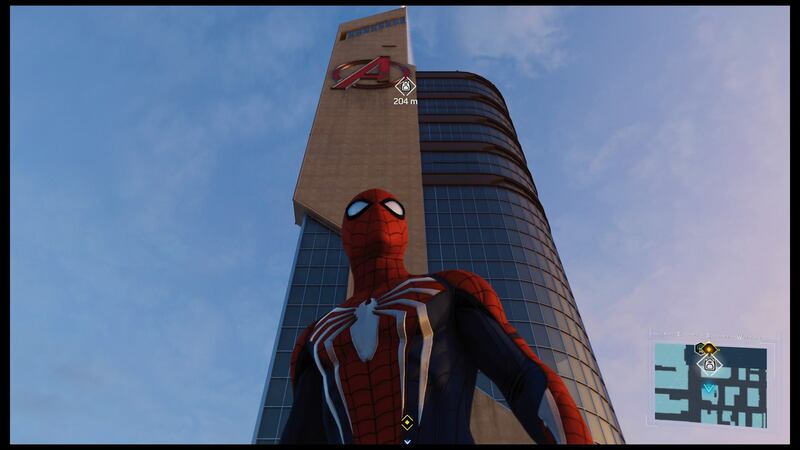 Being Spidey and hanging around New York was so fun that I ended up making the effort to get the game’s Platinum Trophy, which pretty much requires you to do everything there is to do. Doing everything hardly ever felt like a chore until it came to all the last-minute optional crime fighting, which only really becomes annoying if you made a real effort to avoid them as you came across them. But even with that, I wish there was more, and I seriously can’t wait for the DLC to come out in a few short months. Again, Marvel’s Spider-Man isn’t without its blemishes. The fact that you have a skill tree limits the quality of life stuff to deal with both in traversal and combat, and the sections of the game in which you have to be Peter Parker definitely bring the action down to a fast halt. But all this aside, the good grossly outweighs the bad especially if you’re a fan of anything that involves Marvel. The puddles look fine on a PS4 Pro. The awesomeness of the web slinging can’t be overstated, the game looks phenomenal (especially in 4K), Yuri Lowenthal and there rest of the voice cast did a fantastic job playing the game’s cast of characters, the combat combines simple and challenging gameplay to a thrilling conclusion, and most of all–it’s just fun. Marvel’s Spider-Man is wildly entertaining, and we wouldn’t have it any other way. The game was purchased by the reviewer who finished the main story and obtained the Platinum trophy in the game before starting this review.